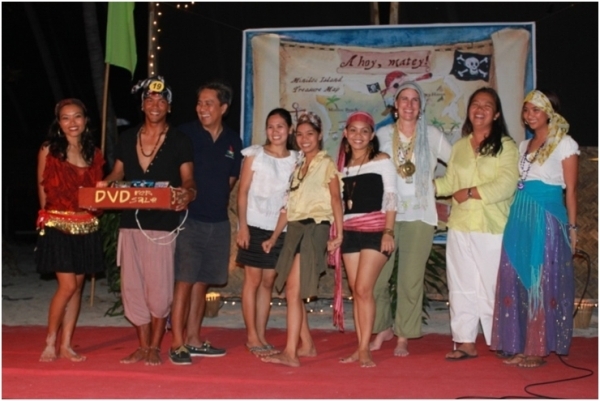 The Front Office Department bagged the grand prize in the 2010 Pa-Berdehan: The El Nido Resorts Eco Challenge, a company-wide competition for environmentally-friendly initiatives. Their entry entitled “Papel Mo, Buhay Ko!” showcased the use of used paper by making them into plant pots that can be used by the Garden Department. Their project will maximize reusing of materials, cut plastic usage, and decrease the cost allotted in buying pots. The Garden Department came in second with their “Broomstick from Coconut Leaf Veins” project while Purchasing Department won third place in their aim to cut plastic usage. Other entries were “Mooring Buoy Installation Using Old Fan Belts and Rubber Tires”, “Valuing Sunlight” and “Conversion of CRT to LCD Monitors”. Pa-Berdehan: The El Nido Resorts Eco-Challenge is a company-wide competition established in 2007 to encourage staff to apply what they learned during the Be GREEN (Guard, Respect, Educate El Nido) environmental practices training seminars. This year’s competition came with the twist as 2010 is the International Year of Biodiversity. Entries submitted had specific organisms that directly benefited from the projects. The MIR Front Office department receives the top prize for the 2010 Pa-Berdehan: The El Nido Reorts Eco Challenge during the ENR Christmas Party in Entalula Beach Club.